The Best Cover Money can buy ! Still Only $599 - Free Shipping ! 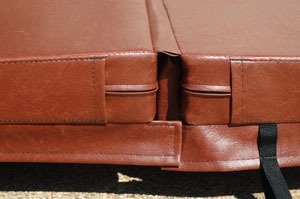 Attention: Spa Covers are all custom made (except Clearance Spa Covers). We do not stock spa covers by the brand of spa you have. You must have measurements of the spa or of the spa cover you already have to have a Spa Cover made. Please click the link above to learn how to measure your spa for a cover. Prestige Spa Covers are extremely high quality covers, for those that want the best. 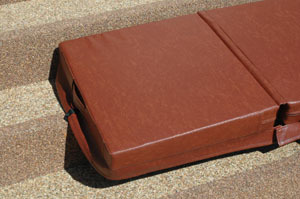 They are of significantly higher quality than other spa covers on the market today. All Prestige Spa Covers are cut on computer driven machines for complete accuracy. If you are sick and tired of buying a new cover every few years, we suggest you invest in one of these ! They are available in a variety of styles and at different price points to fit your needs ( Classic, Prestige Deluxe and Walk-On styles )The Prices listed are for covers up to 8 feet. Larger covers will be additional. Please call for a price. 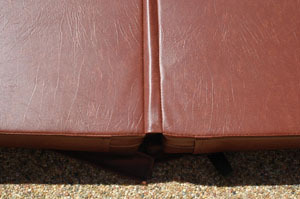 The Prestige Walk-on Cover now offers a 6" X 4" 2lb. density Tapered Foam core with R-17 insulation value. 4 Mil. Plastic perma liner and an extra long steam stopper. Heavy duty marine grade vinyl covering. Four Tie Downs with keyed lock fasteners (Child Resistant Locks). 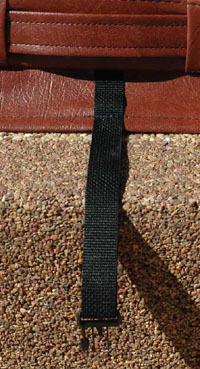 Two carry handles included (one on each side). 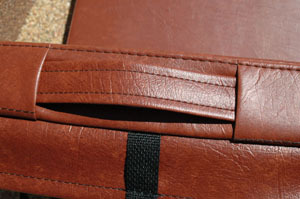 Double sewn seams to keep it from ripping off the cover. Upgraded extra long steam stopper to prevent heat from getting out of the cover through the center fold. This free upgrade extends the standard steam stopper all the way across the entire seam of the cover. 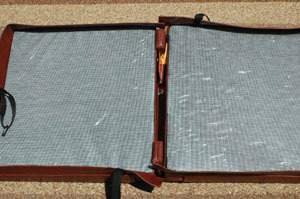 The bottom of cover is made of a fine mesh screening for breath-ability of the foam core (so it does not get soggy and stinky). The foam itself is wrapped in a 4 mil. chemical resistant plastic resist water absorption. 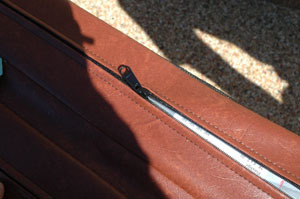 This is the center seam. The seam has an aluminum center channel that is glued into the foam cores to help resist sagging in the center of the cover. 6" x 4" 2 lb. density foam core provides an R-17 level of insulation when on the spa, while still being lightweight and removable with ease. Upgraded 4 mil chemical resistant Plastic perma liner wraps the foam cores to help protect from water absorption, aluminum center channel and extra long steam stoppers make this cover extremely strong and highly insulating. 5 year pro-rated MFG warranty against water absorption. These upgrades come standard on Walk On Spa Covers. 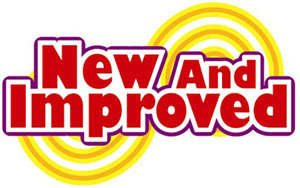 You do not need to purchase any additional upgrades. Foam Core Plastic Perma Liner Upgrade: This heavy duty perma-liner wraps the foam cores in a protective 4 mil. chemical resistant plastic that repels harsh chemicals and moisture, which makes your cover last longer. A Prestige Spa covers exclusive. When do you need a new Spa Cover ? Why choose a "Prestige" Brand Spa Cover ? When your new spa cover arrives please check to make sure it is not damaged before you sign for it. If, in the unlikely event it is damaged, please DO NOT sign for it. Refuse delivery and call us right away. See terms below for more info.